Our attractively furnished 2-person Comfort + rooms are all equipped with comfortable beds with a topper for a good night's sleep. 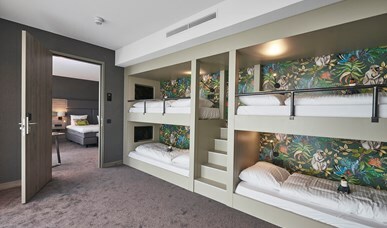 The rooms have extra wide beds with a double mattress. The bathroom has a spa bath and separate rain shower. Prices are without €1.00 euro residency tax p.p.p.n. Een stijlvol à la carte restaurant. Heerlijk eten en drinken in een ongedwongen sfeer. Multifunctionele zalen. De ideale locatie voor Live Cooking, events en bijeenkomsten. Gratis parkeren voor onze gasten op het parkeerterrein. Een ruime parkeerplaats met extra brede vakken. Our Comfort rooms are all attractively decorated and have all the luxury and comfort. Extra wide beds, a rain shower, but also a bath and a separate toilet. Especially for 2 adults and a maximum of 4 children we have this spacious family room. 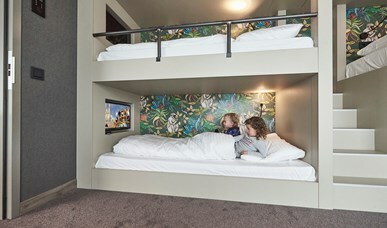 The children sleep in a modern box bed. A generous two-person bed is available for the adults. The room also has a spacious bathroom with rain shower and bath. Would you like to spend a night with your family? 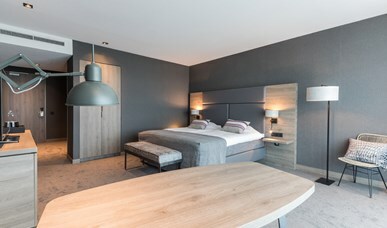 Especially for 2 adults and a maximum of 4 children we have this extra spacious and luxurious family room with an extra spacious bathroom especially for the children.